The band name Haujobb itself is a mistranslation of “skin job”, a term in reference to Replicants/androids from Ridley Scott’s film Blade Runner. These dystopia themes leaked into the band’s aesthetic of man vs. machine and man vs. environment with lyrics expressed as a spoken word stream-of-consciousness. 1996’s seminal Solutions For a Small Planet married DnB and electro with a sonic palette not previously explored. I can’t think of an EBM band that has thrown a saxophone solo into the end of a six minute song (“The Cage Complex”). The band then released Matrix, containing reinterpretations of Solutions’ tracks, with a more techno bent. The mostly lyricless retakes featured beat cut-ups over atmospheric strings/pads that escalated into manic climaxes (“Antiversion”). This bridged the gap as the duo’s work became more abstract to progress into the heady compositions found on Ninetynine. It was a ballsy move that killed Haujobb’s touring capabilities as artistic risk-taking caused rapidly declining album sales. Of course, the introduction of the so-called industrial scene‘s appropriation of trance with monotone vocals as the flavour of the month (see: VNV Nation) had more of an influence on the band’s fallout on the sales front. If it doesn’t have a simple 4/4 beat and a catchy lyrical refrain, we mustn’t play it at a club to allow the deviant public to expand their horizons! This isn’t exactly a slice of audio containing thirty second soundbites that immediately catch the attention of a pop listener, as it should be for music pushing boundaries. It should have otherwise established Haujobb’s voice in other music circles, but the fact they were signed an industrial record label reduced the likelihood of that path. However, electronic music connoisseurs can still now recognize the significance of Ninetynine. It was dark electronic music that embraced IDM and DnB whilst ridding it of the faults of each. Tracks float between genres while still sounding solidly grounded. You weren’t going to find any amen break here. All the quickly passing beats were manually programmed. Samples heading in disjointed directions were not alienating. Downtempo moods were warm and playful while maintaining the balance of groove and progression. Male and female vocals were juxtaposed without any whizzing ADHD stereo effects distracting the listener while jazzy drum samples were seamlessly merged into the mix (title track “Ninetynine”). This is ambient music that initially sounds sparse but further listens reveal its complex programming. Haujobb is an original voice without many colleagues. The closest acts I’ve found to approximating their sound have been Lassigue Bendthaus and perhaps later Gridlock. The decision for diversity on Ninetynine was likely due to artistic fulfilment felt from releasing their multitude of side-projects on different record labels, including but not limited to: Dots+Dashes, N.E.W.T., Cleen, S’apex, Hexer, and Myer. Or perhaps it was the allowance of more input from Dejan? I really don’t know who did what on the record when it came to songwriting and production so it’s all speculation on my part. If you’re looking for more choice offerings from this period’s sessions, check out the single Less along with Ninetynine Remixes released in the same year. These contain the songs in the style of the duo’s side-projects. This was a time of musical productivity that must have consisted of just eating, sleeping, and studio time. 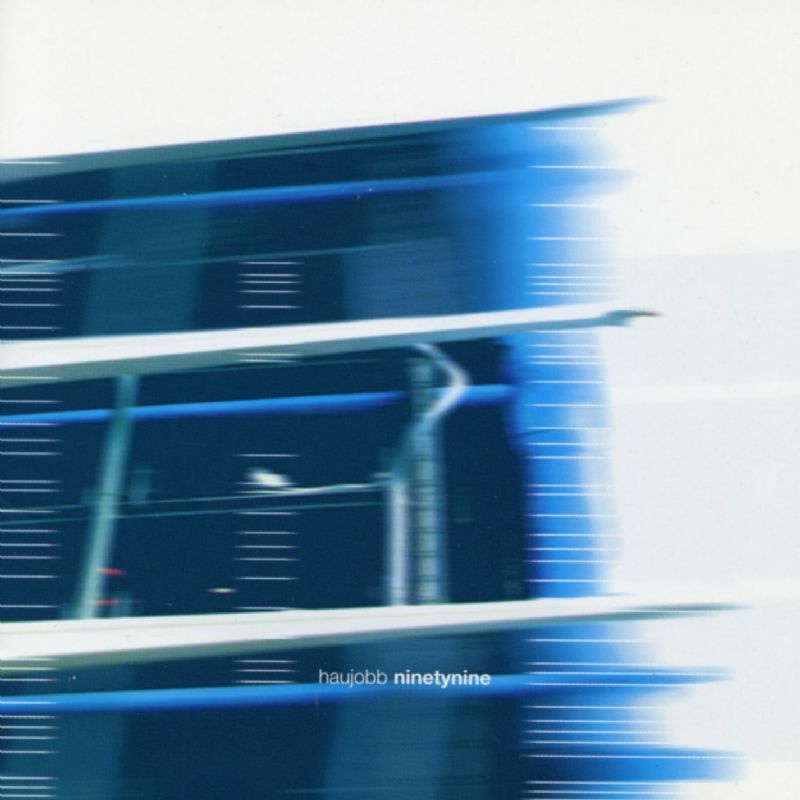 Haujobb’s follow-ups Polarity and Vertical Theory both have moments of musical brilliancy that are unfortunately interrupted by off-tune Dave Gahan-like attempts at crooning and nonsensical lyrics. This is why ESL bands should write in their native tongue (e.g., German) if they can’t translate their thoughts accurately. The ‘jobb were at their peak when ideas were softly spoken and pushed to the background with music being the true voice. This comes back to the concept of artistic integrity which I think Haujobb were enveloped by during the Ninetynine sessions. Record label expectations caused by market pressure can cause artists to do really stupid things to put food on their table. That includes doing remixes for mediocre acts or appropriating other people’s weak ideas into your own work. There have been multiple hints that Haujobb would be finished after each album but it looks like they’re soldiering on, according to the official Haujobb mailing list. Daniel has since joined more successful Swedish band Covenant for their next release but it looks like a new Haujobb will happen. I just wish they’d play to their strengths more often. For other exciting music, check out Portion Control, 80s electronic pioneers from England that have been revitalized by technology over the past four years to release more than five hours of new material along with re-releasing their influential backcatalog for new listeners to discover.